Diggin’ your new ride. Curious – besides, being a custom project, were you looking for certain ride qualities when you approached Davidson? You planning to rock it come this fall for CX season? Yes, rock it! Also, now that I’ve got more time to write about the topic, the D-Plus is a pursuit of passion. It’s the result of a decade of thinking about modal/cross bikes by Mark V, with the work of a Bill Davidson and his crew. Master Builder and OCD types were made for each other. Like Internet dating in 1989. If you were there, it was a guaranteed a match. And the D-Plus is one hot date, in materials, and build. Check the annotated photo below with a full-rez version and more notes on Flickr. Annoted with notes – click through for full size. If you’ve followed us for a while, the D-Plus is a progression from the Modal and Hotspur. The Modal is an S&S coupled Ti bike with Paragon dropouts that toggles from fixed, single, geared, and internal. 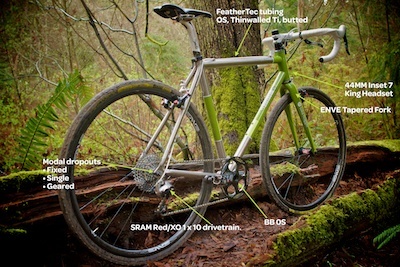 The Hotspur is a Ti racing bike made with Feathertec tubing and a Reynolds carbon rear. Both bikes were intended to prove Ti is a relevant material, in a market flooded with carbon. We’ve been discussing a Cross version of the Hotspur with modes like the Modal since I got back into Cross 3 years ago. The D-Plus has even larger diameter Feathertec tubes and Paragon track tips with a derailleur hanger. In an earlier post, I said the bike is built to fight. It’s also has soul. It’s made here in Seattle, a city of makers and those that believe in what they do. Between Bill, Mark, and me we’ve ridden thousands of bikes, are very picky, know what we like, and don’t. Also what works where we ride and race. This bike is tuned to the high-end and wound up tight. As expected with the Feathertec tubing, BB OS, 44 mm head tube, and tapered fork, it rides as a modern Ti racing bike should. It’s a stable platform when you’re twisting it around a race course. Dismount, remount, into a tight turn; down, and up a flyover, the D-Plus will go where you point it. Most importantly, it’s got the “springy” Ti ride. The ride qualities Brian asked about in the quote above are best expressed in trust. I trust this bike completely to not let me down and perform as I expect. 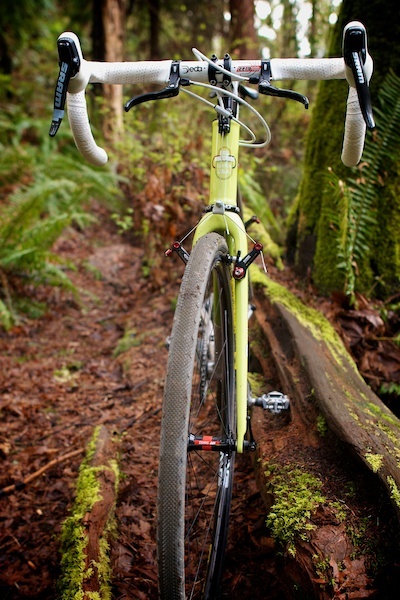 Sharing the same qualities as the Parlee CX-H, the tail doesn’t wag the dog. In other words, the front end isn’t waiting for the rear to catch up, or the fork to stabilize. The parts are interconnected and track true. It also doesn’t shudder. On one of my Cross workout rides, there’s a transition from grass to concrete that’s always very harsh. Carbon bikes shudder across the section while the D-Plus just glided across it, as if the bump was a mole hill. As built and spec’d, the D-Plus costs about $10K USD. Detune the spec and knock thousands off the price or weld it in steel and expect ~3k. That’s a price that should encourage an enthusiast to line up at a local race with a handbuilt bike. 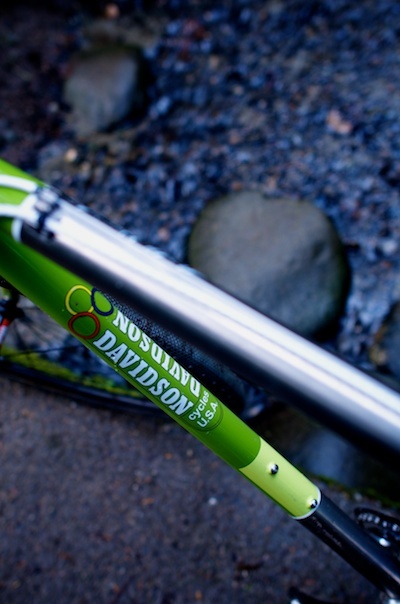 If you’re interested, start talking to Mark V and Bill at Davidson Bicycles. We call this bike the D-Plus because of all the +1s it has. In keeping with Mark’s style, the spec is subtle. 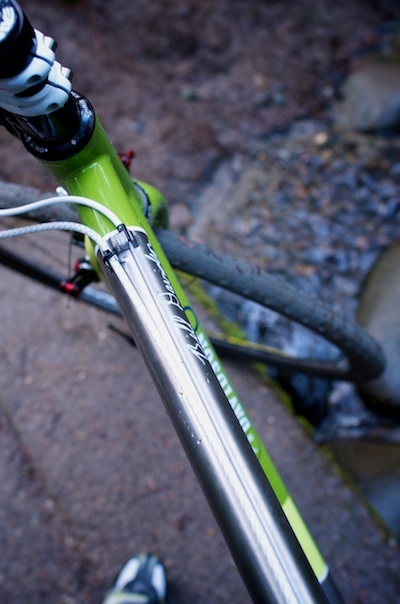 The more you look, the more details you’ll notice, like the mud-free, cable-guide routing. 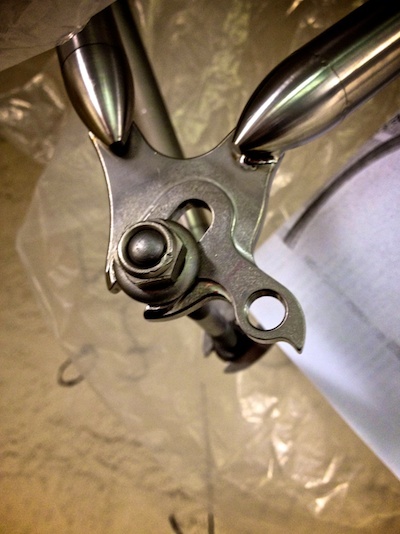 Second in importance to the stiff, springy, sure-footed ride is the Paragon slider derailleur hanger. Depending on the course and my mood, this bike can race single speed or geared. In the winter and/or off season, I can throw down with it in fixed-gear mode. Put fenders on it, 25s, and it’s a rain bike too. 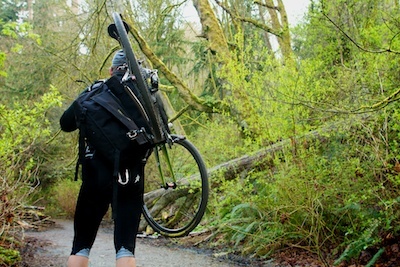 Finally, cause I know you’ll ask, for Pacific Northwest dirt crits with barriers (jungle cross no more), disc brakes aren’t needed or desired. When the industry delivers lightweight and intregrated hydraulics we’ll talk about that more. Until then, we’re not interested. Racing weight is 17 pounds with nothing crazy light or sketch. Memo! Re: Flexy Carbon bikes aka Fondo bikes. Steel & Ti naturally absorb road shock without elastomer gimmicks. Weigh ‘bout the same. The latest developments in carbon are to make it flexy for Fondo riders, an aging demographic. Well, to those Fondo riders who may want something more suited to them, spec’d and built how they want, check out a bike maker near you. Inquire about steel, Ti, and carbon. Those materials are more relevant to the ride you want and the ride of the D-Plus. We’re riffing on the work of Tim Rutledge, Bob Parlee, Gary Klein, Matt Chester, and others with this bike, including the Surly Cross Check. Also thank ENVE Composites for the wheels. So we’re curious about what you think. Does this bike interest you? How would you built up your own custom project? and the #makebikes on G+ and Twitter.